It was in the 90’s here today, and yet I have to admit that I’m ready to will fall into existence! Bring on the pumpkin spice everything! Well, maybe not the pumpkin spice Tropicana, hummus, or Pringles. Those just seemed highly unnecessary…not to mention gross. I did some “fall fluffing” in the dining room and wanted to show you the progress on this year’s fall dining room look. 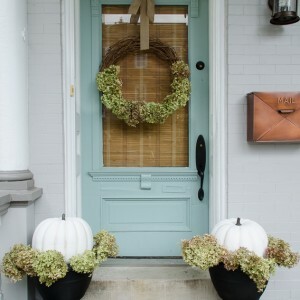 I had originally planned on using more traditional fall colors in here this year and yet my hydrangeas just sucked me in! They are just perfect for early fall. I love how all hydrangeas team up and turn this glorious shade of green this time of year–with just a kiss of their former pinks and blues. But before we gush any further over the hydrangeas, let’s just address the elephant in the room shall we? Hello, brick wall. 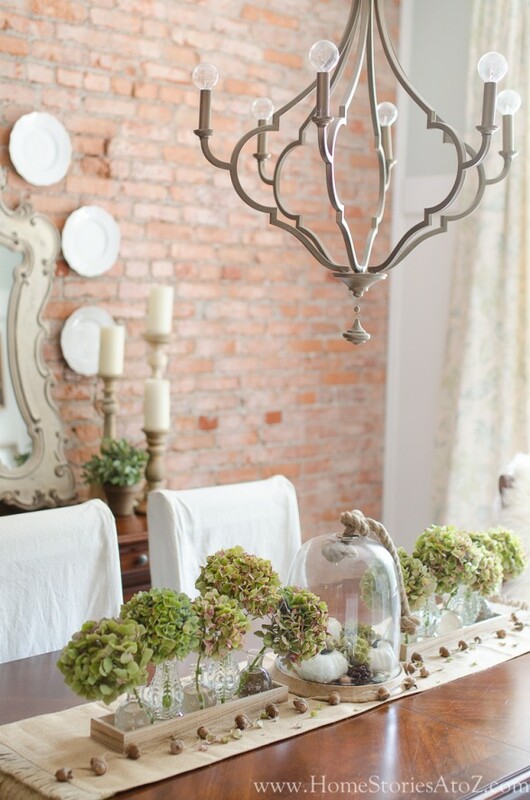 My brick walls always seem to steal the show so let me fill you in on a little of their backstory! We live in an urban row home “twin” that I helped flip 8 years ago. Removing all the 100 year old plaster from the walls that adjoin our home to our twin’s revealed this gorgeous brick beneath! I have one wall of 100 yr old brick extending three stories. It is in the dining room, hallways, and all of our bedrooms and I love it! It has it’s drawbacks though. I’ll have to write a post exclusively about the brick soon. Okay brick, you had your moment, now back to the hydrangeas. 🙂 I clipped all of the flowers from my garden and placed them in some cute vases from Kirkland’s. 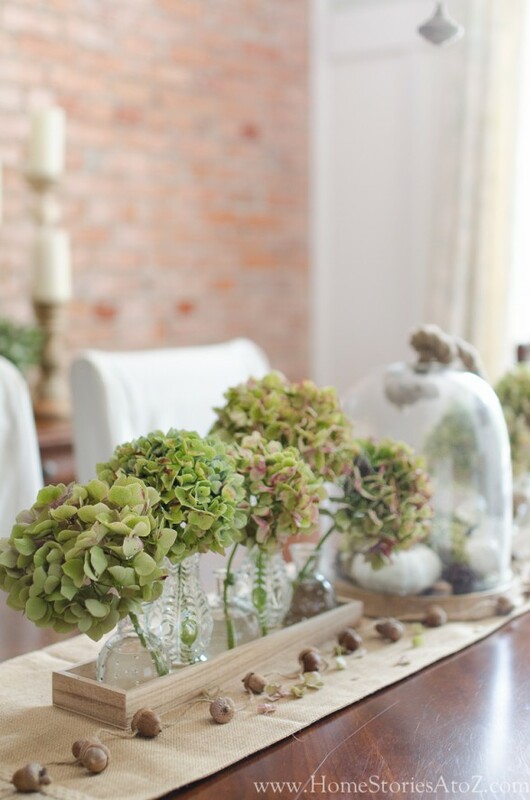 (I’ll have an upcoming Kirkland’s giveaway for you so you can acquire your own cute vases if you’d like! Stay tuned.) 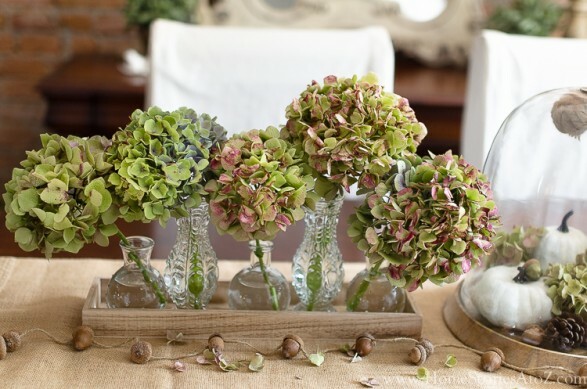 To dry hydrangeas, I usually clip them this time of year, place them in water, and just wait for them to dry out on their own. You can skip the water but I find they dry better when given more time to do so. They will typically become a bit more shriveled-looking than this as they dry out but will still look fantastic. The trick to drying hydrangeas is to cut them at the right time. If you clip them too early, then the petals still contain too much moisture and will shrivel extensively as they dry. 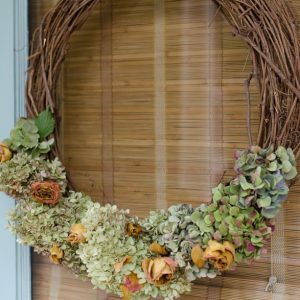 To maintain their green color throughout the year, keep them out of harsh direct sunlight. They will turn brown if located in strong sunlight–which can also be a nice look. 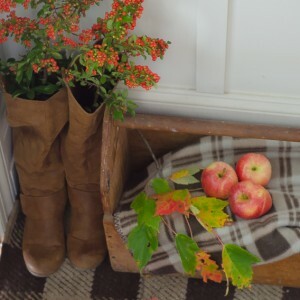 I pulled out all of my fall decor bins today and began sorting through what I might be able to use this season. However, trying to get everything in my home ready for my fall home tour is next to impossible with the kids still home. Yes, my kids are still(!) home on what has to be the longest summer break known to humankind—especially motherkind. Granted, it’s been a fun summer, and I love my kids more than chocolate and wine, but Lawd have MERCY we are all ready to get back to our school year schedule! My kids have been out of school since late-May. It’s time. They go back next week after Labor Day, and I plan on whipping this house into fall shape once they are safely contained and away from the mercury glass pumpkins. In the meantime, I’m living in my fall dining room. Seriously, I’m not kidding you. I’m sitting here in my sheepskin-covered chair, sipping on Earl Gray, typing to you, and just pretending that the rest of the house isn’t a confused summer-fall-mish-mash mess. Want to join me? Let’s just pretend it all looks this fresh and soothing. So the lesson for today is take time to smell the hydrangeas–er, no matter that they don’t smell! 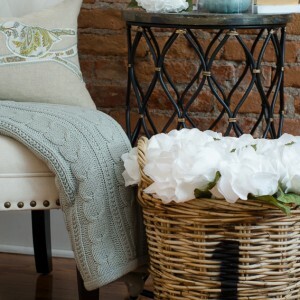 If you’re feeling chaotic today, try to spruce up just one room in your home. It will create the illusion of control and have you feeling a bit calmer in the midst of the storm. And if all else fails, there is always chocolate and wine! 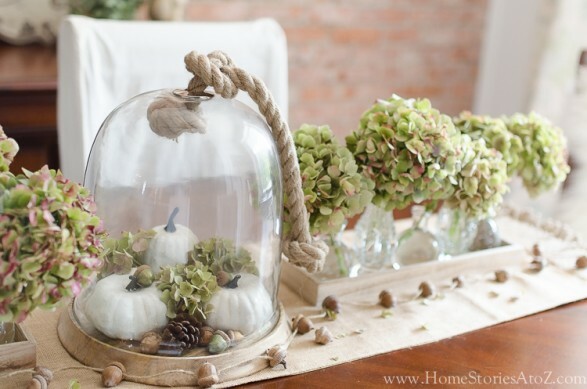 If you liked this post, you might like my other related fall decor posts below. Check them out! Beautiful! Where did you get those tall candle pillars on your buffet? Thanks! They are from Birch Lane. 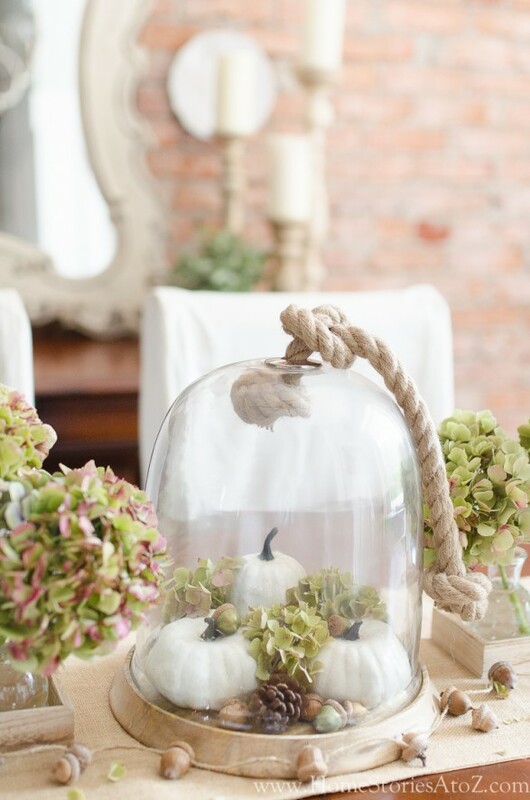 I love the fall decorating! Where did you get that amazing chandelier? It’s perfection. The dining room looks lovely. I have moved to Florida from Ohio and really miss having beautiful hydrangea to cut and use dried. You have obviously cut them at the perfect time. Beautiful…very organic and natural! Love it, Beth! 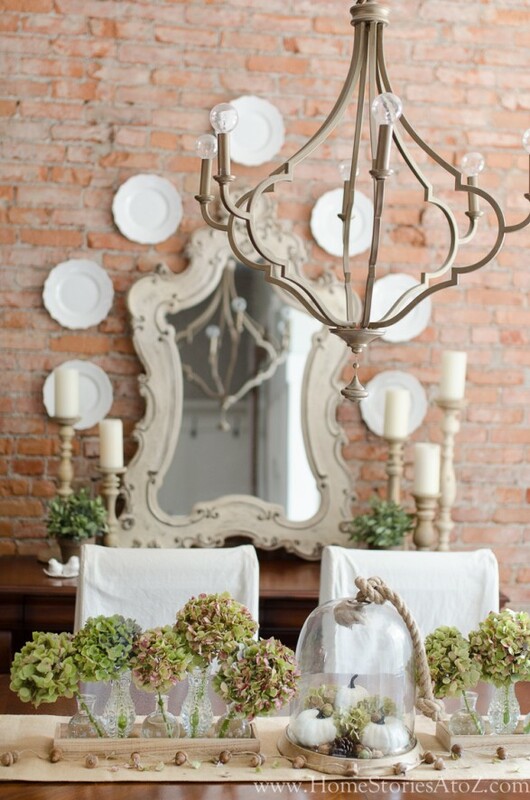 I love that brick wall & even more because it’s in the dining room!! 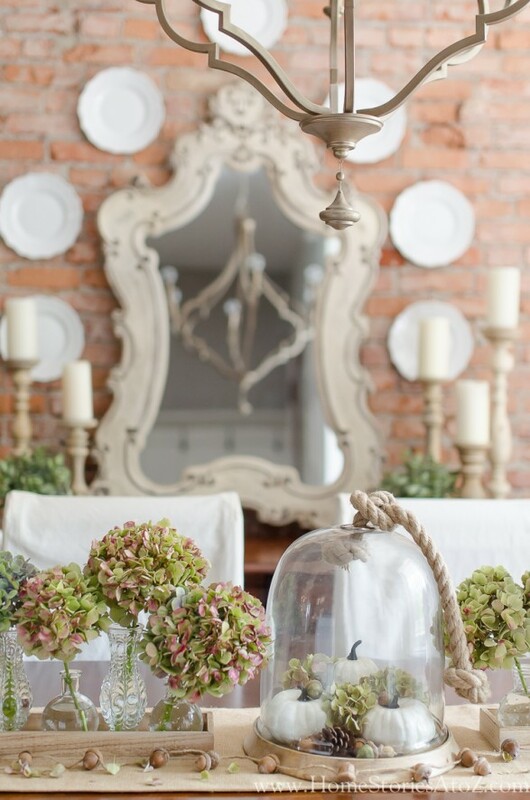 It adds so much charm & the table decor is fantastic and flows so well !! Happy Friday!! !